We’d love your help. Let us know what’s wrong with this preview of The Winged Fae by Terry Spear. Serena, a royal member of the Mabara winged fae, has one goal in mind. Stop an impending marriage with a dark fae. As the fae are known to do, she stirs up trouble that she hopes will make her point and get her off the hook. Only nothing goes as she plans. Niall, a royal member of the Denkar, aka the dark fae, is visiting South Padre Island when he catches a winged fae pain Serena, a royal member of the Mabara winged fae, has one goal in mind. Stop an impending marriage with a dark fae. As the fae are known to do, she stirs up trouble that she hopes will make her point and get her off the hook. Only nothing goes as she plans. To ask other readers questions about The Winged Fae, please sign up. Terry Spear's Fae Series is just fun. They are short, light-hearted YA novels. I enjoy them immensely and this one was no exception. Just plan fun. What an enjoyable book and yes the character we came to love in the previous books in this series came out to play again :). I really like Terry Spear as an author. She presents her characters in such a detailed way that were we children, okay, you are absolutely correct, as Big Kids at heart we like the characters A Lot! That is why I will begin book 6 as soon as I can. Books like hers are well worth the price. Sweet as it can be! This is the 3rd boo My Thoughts - 5 out of 5 Unicorns - I loved it!!! One thing I love about Terry Spear is when she has a narrator for her series, she sticks with that narrator. I think it makes a big difference because you don’t have to get used to a new narrator for a series you are listening to. Jeanne Whitehouse is a fantastic narrator. I love when a narrator brings the story to life for you with different voices and doesn’t sound monotone. I think this is the reason that most students hate listening to the audio version of books in the classroom because most of the narration I heard was from a boring narrator. If you can’t engage them through fun narration just have them read it themselves. Terry writes an awesome story, and her words make the story come alive. I could picture everything happening. Serena is fun and won’t back down when she believes in something. She also goes out of her way for someone when she believes in them. Niall is protective and sticks with his heart even if it could get him into major trouble. "Sweet as the lips that once you pressed." 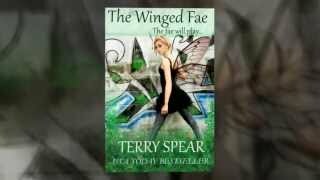 THE WINGED FAE by Terry Spear is the third book in Terry's World of Fae series. It's an utterly enchanting fantasy for young readers and those who are young at heart. I have thoroughly enjoyed the prior two books in her World of Fae series and this one was the best yet! This book can be enjoyed as a standalone, but I would highly recommend that this series be read in order as there are interconnected characters from the previous books who "Sweet as the lips that once you pressed." 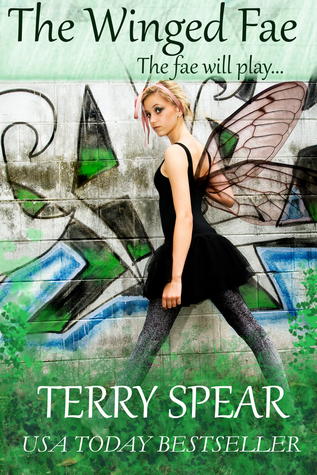 THE WINGED FAE by Terry Spear is the third book in Terry's World of Fae series. It's an utterly enchanting fantasy for young readers and those who are young at heart. I have thoroughly enjoyed the prior two books in her World of Fae series and this one was the best yet! This book can be enjoyed as a standalone, but I would highly recommend that this series be read in order as there are interconnected characters from the previous books who come back to frolic in this one in major roles. Love, love, love romance, the paranormal, hunky Highlanders with their delicious brogue and hot kilts, so Terry Spear writes about those hunky Highlanders both in medieval times and as wolves in contemporary times. Jaguar shifters too! And young adult urban fantasy. And romantic suspense. She grew up reading mystery, adventure, mythologies from around the world, ghost stories, the paranormal, fell Love, love, love romance, the paranormal, hunky Highlanders with their delicious brogue and hot kilts, so Terry Spear writes about those hunky Highlanders both in medieval times and as wolves in contemporary times. Jaguar shifters too! And young adult urban fantasy. And romantic suspense. She grew up reading mystery, adventure, mythologies from around the world, ghost stories, the paranormal, fell in love with Dracula and Wolfman, and felt they needed loving too. Everyone should have someone to love. Which means her stories always have a HEA. “...She squeezed Niall's hand and bleakly said, "I don't want you hurt." “Oh, what had she done?" He'd startled her; that was the problem. It was all his fault he was lying on the ground, looking rather cherub like, his blond hair curling about his ears, his bright blue eyes closed now, his masculine lips parted slightly as he slept the sleep of the dead.